The capital city of the island, Ibiza town (Eivissa), is located in the southern part. This incredible town will delight you from the start. Although in 1979 was established by law that both the island and the capital city were called Eivissa, generally, Eivissa (in Catalan) refers to the capital city and Ibiza (in Spanish) to the island. This city of around 50,000 inhabitants has plenty of history. It is located over a hill and you will love to get lost on its narrow streets. 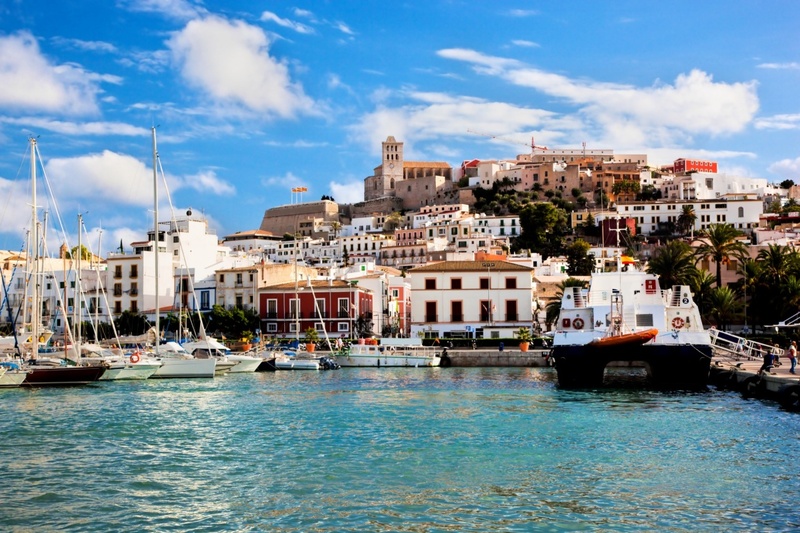 Ibiza town is one of the oldest cities in the world having more than 2,600 years of history. Keep on reading to know some the best places to see in this town. Las murallas stands for the walls in English. This Reinassance walls were built in 1555 as a way to protect the island against the large number of pirate attacks. Carlos I and Felipe II were the ones who ordered its construction. Las Murallas of Ibiza were designed by the italian engineer Giovani Battista Calvi and are the most well conserved walls in Europe. A couple of years later, in 1575, an expansion took place in the hands of another italian architect. The cathedral of Ibiza was founded on the 13th century and is dedicated to Santa María la Mayor or Santa María de las Neus. When Ibiza was conquered by the christians, the largest mosque was replaced by a place of catholic cult which is now the cathedral. During the 13th century and part of the 14th, the mosque was used as a parish until the 14th century, when the moslem building was demolished and a new catholic temple was built. The cathedral overlooks the city and remains its symbol. Figueretes, Talamanca Beach and D'en Bossa Beach are the three beaches located in the capital city of Ibiza. Figueretes is the main beach of the city which offers several services, as hammocks and parasols. D'en Bossa Beach is the longest beach in Ibiza. The castle of Eivissa (El Castell in Catalan) is located on the top of the Vila peak. It was a fortress together with the Almudayna building. The 'torre del homenaje' (the homage tour) has an arabic origin and the walls were built between the 13th and 17th centuries. That fact makes the castle lack of an architectural unity. It also keeps some gothic and renaissance elements. Although it is only available to visit the outside of the castle, it will worth your while. Sa penya is a neighborhood located in the high side of the city. This neighborhood was the residence of the sailors, the hippies, the artists and now it remains the home of just a large number of gipsy families. Sa penya is a continuum of old houses in ruins which is better to avoid at night, as it might be very dangerous to walk through its streets. Find information about selected Hotels, apartments and rooms in Ibiza Town (Eivissa) to choose the perfect place for your accommodation.